Oooh yes! I am! Rahi section coming tomorrow, baby! I am working on Ehlek's story aswell! It may be the best one yet, but it requiers a lot of time writing it, even though it isn't very long. Stay tuned! Added the Rahi section! @Bokarda, the last one may be of interest to you and your Kal topic! An individual, like Irarok. He is thought to be a myth, just like people believe Krakens are myths. Either way, giant squids are real. EDIT @AntrozT6: You wouldn't happen to have an image for Khambrass, would you? Also, your Ammonite image is messed up. Sadly, I don't. I am not really good ad drawing animals, giants squids made partially of metal included. And I removed that ammonite picture, though it was ok for me. I guess everybody knows what an ammonite is and how it looks like. Added a whole huge section called Old Artakha, depicting the regions how they were during the reign of the seven warlords! Removed the "Problems" part due to character limit! I'm really digging the lore in the Kanohi War period, especially Tiro and Naho! Just to clarify, you've been saying that the Toa Kanohi are the third Toa team. What was the team between the First and the Kanohi? As for the Kanohi War and the War of the Warlords (heh, reminds me of something) I'd love to make a discussion with you as to how exactly and perfectly tie-in the Kanohi, City of Masks, the Mask-forging and the Barraki into one, huge, megapitch! That sounds like a good idea!. I'll start the megapitch and compile the basic topics! Also, the "third" is mentioned in Ancient Motara, and one other place. I'm just concerned about continuity. can I help designing the minifigs? Why of course! Don't even ask! Go for it! @Bokarda I wrote "At the time of the third Toa Team" instead of 'today'. I guess it's my fault I wrote it in the weird thense I did. Just to be sure, the Third Toa Team always, always referres to the current one, Izotor, Narmoto, Kivoda, etc. The second is always Tuyet, Lesovikk, Lhikan, etc. Alright, I've made a Kanohi Period megatopic, which contains the history of the period. This new megatopic can be used to further explore that specific period of time. By the way, I am both cringing and laughing right now. I was joking on myself that if TTV ever adresses my pitches on the Boards, it will be the Dances of Artakha, a thread I wrote in half-an-hour, instead of this super-brainstorm we pitched out over the course of three months. Jokes on me, I guess, Dances got discussed, while the Barraki haven't been touched on by a word.. This pitch at least.. I mean, they could just mention it in a sentence..
That is both hilarious and depressing . Although, this does seem like a very TTV kind of thing of them to do. We can only hope for Brainstorm #5 to have the megatopics included! One of the problems might be that there is not enough pictures to keep them interested. Yeah, sounds a bit lame, but what does a majority of people (myself included) do when they get their hands on a new book? Browse through to see if it has any pictures. And I understand that, @DarkMaestro's Mask of Time got mentioned because it's short, interesting and has a beautiful picture! This pitch (and only subjectively) is only interesting. Yes, some amaizing pitctures of the warlords by @Noupix, but no original art apart from that. Like Prpl said, I know it may be hard to read through this wall of pitch. 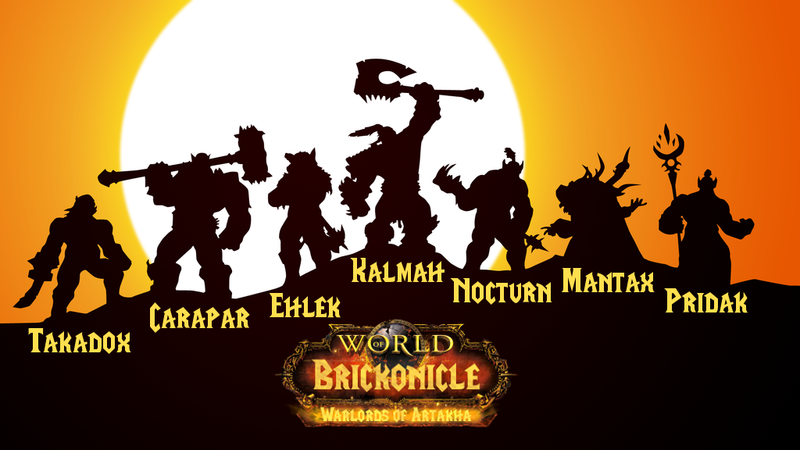 If we had a picture about each of the warlords in detail in their environment, all seven warlords standing on a hill or smth (Lmfao that wasn't even intentional) or even a picture about their battle with the Toa (Kalmah or Carapar riding a Kanohi Dragon would be sick as Karzahni!) it would be a lot, lot more visually pleasing and would encourage more reading. I may try to beg DarkMaestro on my knees for something, as I am unable to produce anything that would catch their eye. Let me know what you think. Imagery is definitely the way to go for trying to get their attention. You wanted it, you shall have it! Explore new/old Artakha, ruled by cruel Warlords! Dive deep underwater to a lost city of Mahri! Defeat new villians, find new friends, see you past selves being way more epic than you shall ever be! Only if you read this thread! Though to be fair, it's also a hit-and-miss with the cast sometimes. Of the multiple times Apotheosis has been discussed, poor Irarok has never shown up, and now he's been booted from canon. The problem with a mega thread like this is that it's constantly evolving with 135 posts to date; it's too much to read through for a possible major addition to the storybible. Maybe if the details have been set straight, you should condense all of the info down and make a new post; that'll probably be easier to digest. Also, am I to expect some begging soon? A good thing to win me over is the tears of orphans and a box of kittens. @DarkMaestro Well, but it is condensed into one post, that is the main topic. The only thing not very clear is the inclusion of Karzahni, that is controversial and should probably be removed, but we'll have to discuss it first. Otherwise, you were never supposed to read all 137 (now 8) posts, just the original topic, which (as stated at the bottom of the pitch) is continuously updated, new ideas always being added. You can see that with the third part (Old Artakha), that was never there before, only being added recently, and if you look into the edits, you can see the descriptions of the timeline and the characters have changed multiple times. Thanks for the reply, though! How many kittens? According to the recent Reply episode, if no one says "I'm Eljay" then you may get those tears. Funnily enough, I had to separate my Kal pitch from my Future pitch for the exact reason of everything growing to large. Ironically, my Kal pitch is now larger than my Future pitch . My Kanohi Period pitch kinda covers Old Artakha, although it focuses more on the war and the Toa Kanohi. That said, @AntrozT6 could make a separate pitch specifically for Old Artakha, and then I could link it to the Kanohi Period. Would the tears of kittens and a box of orphans work?